Useful information on some common eye problems. The pages in this section have been dedicated to providing more detailed information about some common eye condition and is mean't as a follow-up to your eye examination. You may have been advised of one of these conditions during your eye examination, we have provided these guides to help you understand more detail about the eye problems and what can be done about them. Before we start, it's probably best that you understand a little more about the healthy normal eye. 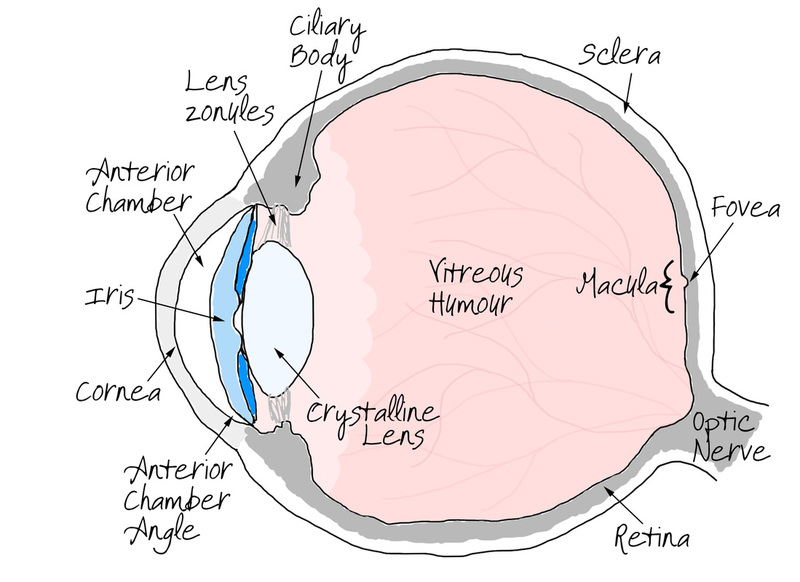 Opposite you will see a schematic diagram of the eye explaining some of it's structures. Cornea - The clear window of the eye which focuses 90% of the light onto the retina. Conjunctiva - A thin translucent layer that covers the visible surface of the eyeball (apart from the cornea) and the inner surfaces of the upper and lower eyelids. Sclera - the white outer layer of the eyeball. Iris - The light regulating diaphragm of the eye (rather like the aperture control on a camera). Pupil - Simply the hole formed by the iris aperture allowing light to pass through to the retina. Anterior Chamber - The cavity formed by the cornea and the iris, it is filled with Aqueous Humor. Anterior Chamber Angle - The angle formed where the cornea meets the iris. Aqueous Humour - This is the nutrient rich fluid created in the Cilliary Body which the flows through the pupil and into the anterior chamber. There it circulates passing it's nutrients onto the avascular cornea before draining away through the trabecular meshwork in the anterior angle. Trabecular Meshwork - A sieve like structure containing within the anterior chamber angle. It aids with the drainage of the aqeous humor from the chamber. Ciliary Body -The structure that produces the Aqueous Humor and provides the muscle power to change the lens shape when accommodating (reading, etc). Lens Zonules -The fibrous strands that connect the Ciliary Muscle to the accommodating Crystalline Lens. Crystalline Lens - Provides some of the focusing power of the eye but it's main function is to change the fiocus by accommodating when reading and viewing things close up. 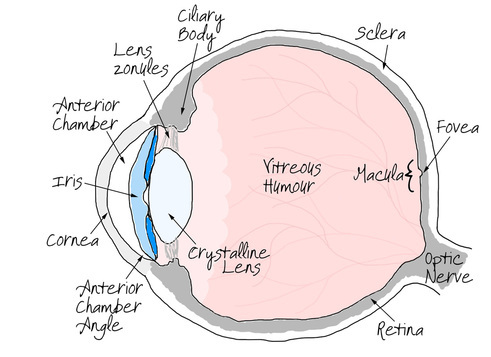 Vitreous Humor - The jelly like substance that fills the eyeball cavity creating the globe-like shape. Retina - The light sensitive layer at the back of the eyeball. Macula - The central area of the retina where upon the light is focused and of which most of your central vision is encompassed. Fovea - The very central point of the visual field at the centre of the macula. It represents the very detailed central vision such as that used for reading and recognising faces. Optic Nerve - "The cable leaving the eye" it is the nervous tissue carrying the sight giving signals from the retina to the occipital area of the brain.